Nematode reproduction on the nematode-susceptible tomato cv. Durinta grafted onto the Mi-resistance gene tomato rootstock SC 6301 was compared to the Mi-resistance gene tomato cv. Monika in a plastic house infested with Meloidogyne javanica. The ungrafted susceptible cv. Durinta was included as a control for reference. Final soil population densities were lower (P ≤ 0.05) on the resistant than susceptible cultivar but intermediate values were recorded on the rootstock SC 6301. The lowest numbers of eggs per gram root were recorded on the resistant cultivar followed by those on the rootstock; in both cases, they were lower (P < 0.05) than on the susceptible control. Cumulative yield (kilogram per square meter) was higher (P < 0.05) on the resistant than susceptible cultivar whether or not it had been grafted. 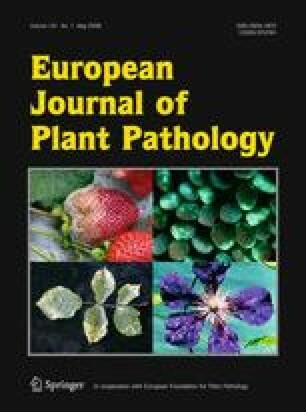 The rootstock SC 6301 provided an intermediate resistance response to M. javanica and was less effective than the resistant cultivar in suppressing nematode populations and plant damage under the experimental conditions of this study. The authors thank Fundación Ramón Areces and Ministerio de Educación y Ciencia of Spain project AGL2004-01207 for financial support.